Do you live in San Francisco? Cool, I hear it’s a nice city. Oh, do you own a Smart Car? You might want to check outside and see if it’s resting on all four wheels as it’s supposed to, after police say a roving pack of vandals has been going around the city overturning the teensy little vehicles. 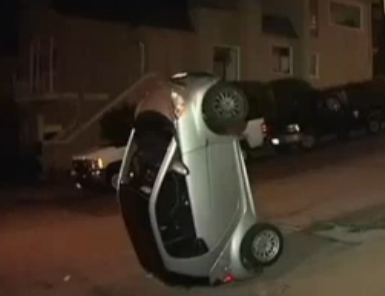 Flipping over Smart Cars makes me think of the mean people who put turtles on their backs just to see them struggle to right themselves, only in this case the vehicles can’t wiggle in protest. Their owners, however, are probably really ticked off, reports NBC Bay Area. The news station found at least four of the vandalized cars, which have been flipped onto their front or rear ends or on their sides. “Whoever is doing this just has misdirected anger,” said one woman who was carsitting for a pal. Police say the suspects are still out there and will face felony vandalism charges if they’re ever caught. And it sounds like quite a fair amount of witnesses noticed something was amiss over the weekend. One man said he saw about six to eight people wearing hooded sweatshirts flipping cars at 1 a.m. this morning. “They look like they are dachshunds sitting up on their hind legs,” he added. So cute! But so wrong. As for why these miscreants are out there behaving badly, it’s not totally clear — but it could just be that the cars are so itty bitty and light, well, it’s just too great of a temptation for the more dastardly among us.